The mechanical properties of supports in a mechanical system strongly affect its dynamic behavior under real operating conditions. This work presents a new method for identifying the dynamical characteristics of local supports which has been developed along the lines of the work by Özgüven (Mech Syst Signal Process 4:53–63, 1990) and Debut et al. 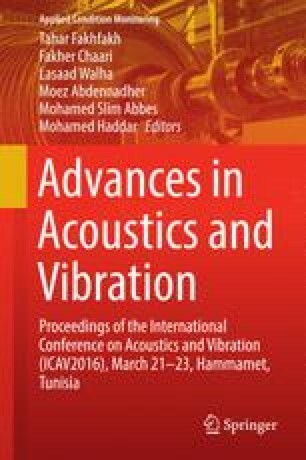 (Proceeding of the 19th international congress on sound and vibration, Vilnius, Lithuania, 2012), which combines measured frequency transfer functions and techniques from structural modifications . As typical for inverse problem , the noise in the frequency transfer functions lead to faulty identifications , so that regularization techniques have been implemented to mitigate noise amplification in the inverse problem . The proposed approach has been then numerically tested on a multi-supported structure, which can be seen as an idealized electricity generator rotor shaft. The results are satisfactory for noise-free data as well as under realistic noise levels. This work was supported by the Portuguese FCT through the bilateral agreement Portugal/Tunisia 2013–2014.